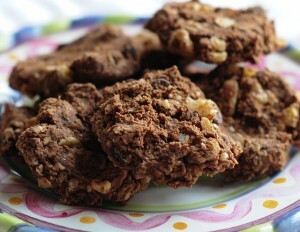 Healthy Raw Chocolate Chip Cookies | Get Krieger Fit! Combine zucchini puree (simply puree zucchini in your food processor), agave and coconut butter in food processor. Blend well. Mix together oat flour, cacao, and cinnamon. Stir in wet mixture. Combine well. Stir in oats, optional walnuts and optional cacao nibs. Mix well. Press into cookie shapes and dehydrate for 30 minutes at 140, reduce heat and dehydrate for 4-5 more hours at 115. Don’t worry about the higher heat to start, the food temp doesn’t go above 115 and it reduces your dehydration time. This entry was posted in Healthy Recipies on July 22, 2014 by sabinekrieger@hotmail.com.